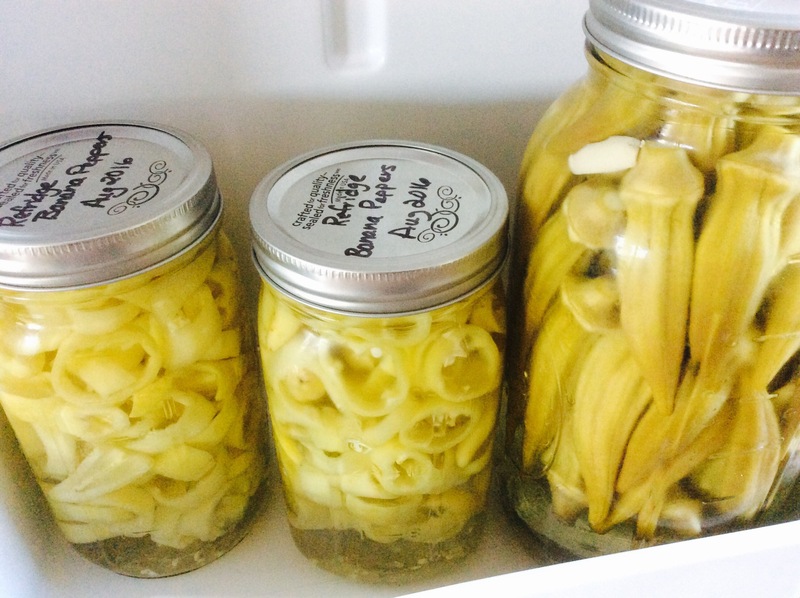 After yet another round of canning in the camper I felt the need to write about food preservation in small spaces. Until the new farmhouse kitchen was installed I had planned on taking the year off and place my focus solely on the remodel. When my husband insisted on creating our new garden before the house was finished I never thought it would be as bountiful as it was in its first season. 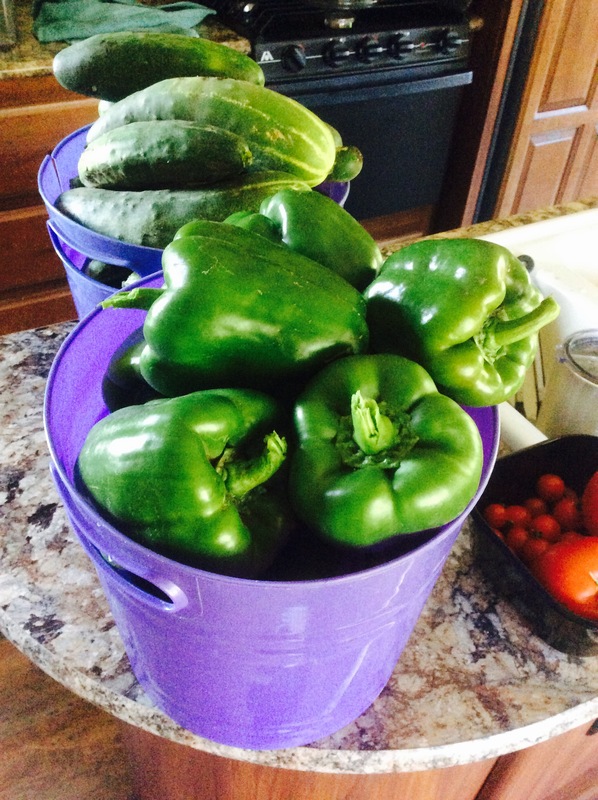 I hardly watered, I didn’t even fertilize and yet we had an over abundance of goods. So much so, I couldn’t find enough people to give it to which lead me to preserving what I could. I hate waste. My first round of preservation was blanching green beans for freezer storage. This was going to be a nearly impossible task on the confined propane stovetop in the camper. The vent hood hung entirely too low to be practical when dealing with large pots of boiling water and trying to remove batches of beans. Not only that, with as many beans as I was processing, there was little space to shock them in an ice bath and lay them out to dry for packaging. This brings me to the first rule of small space preserving; enlarge your workspace by moving outside or moving outside your designated kitchen area. In my case, I moved outdoors. 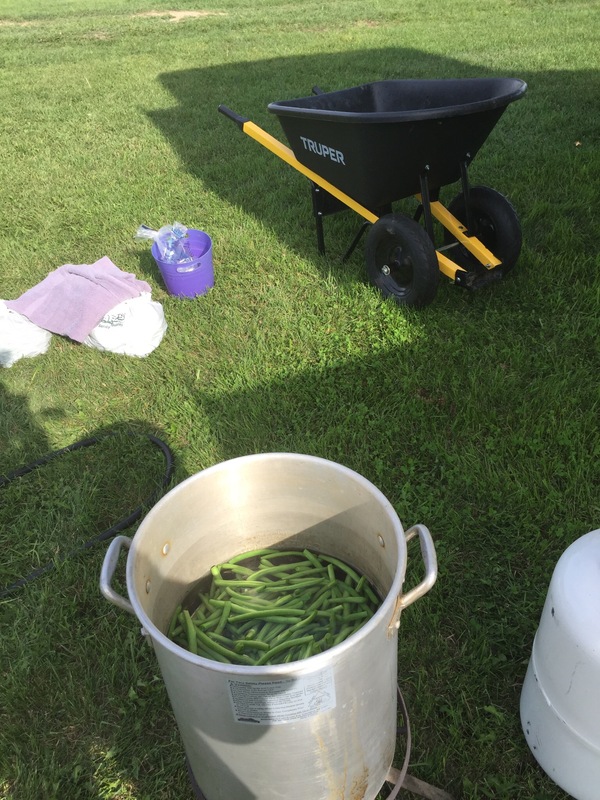 I gathered the turkey fryer from the Quonset as it had a perfect basket for straining out beans from the water. A clean wheelbarrow made a great shock tank filled with water from the garden hose and a big bag of ice. Clean bath towels provided a nice space to dry beans. A fold up table would have been a great asset to use for the drying and packaging process. Use other space you have around you. Ever thought of using a clean bathtub as a shock tank? This added space allows you the ability to have large batch preservation, especially if you are freezing your food. The only step requiring heat is the hot water used for blanching. Rule two came to me as I contemplated the idea of the turkey fryer; seek alternate cooking options. Get creative, who says you have to use a stove? Invest in a hot plate or consider a rocket stove. Maybe you have a propane grill with a side burner; with support, it would work well to boil water or cook up batches of stewed tomatoes. The point is, think outside the box. For me, the turkey fryer was no different than using a gas stove. During my most recent round of hot water bath canning I employed my regular canning pot and jar rack on the turkey fryer base. It fit well and worked the exact same way as it would have on the stove. It was a real time saver and I felt more secure with the rack in place instead of limping along with the fryer basket and pot. Organization is key in rule three; have a detailed plan. In a small space it’s critical to review the logistics of what you would like to accomplish. Set up your space in stations to keep things clutter free and workable. 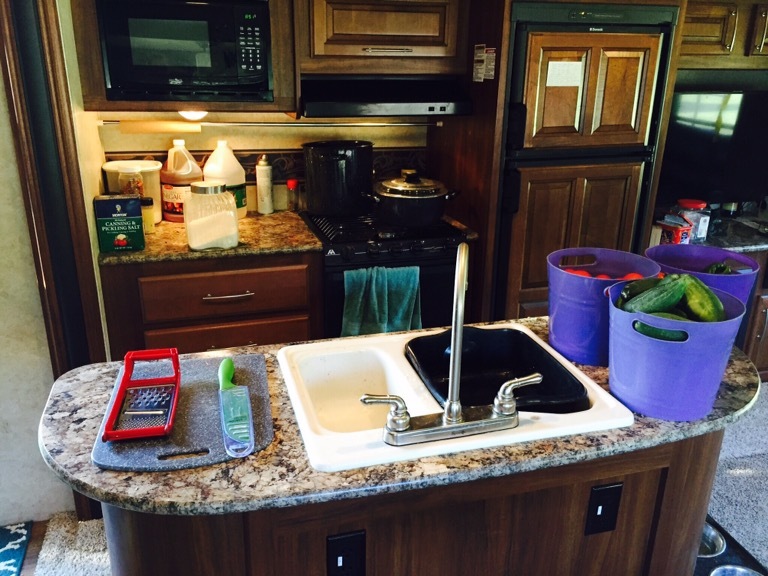 For example, in my camper kitchen I planned to make sweet relish, pickled okra and a batch of pasta sauce. I was a little over eager but with planning I was able to process everything by zoning out areas for specific tasks. 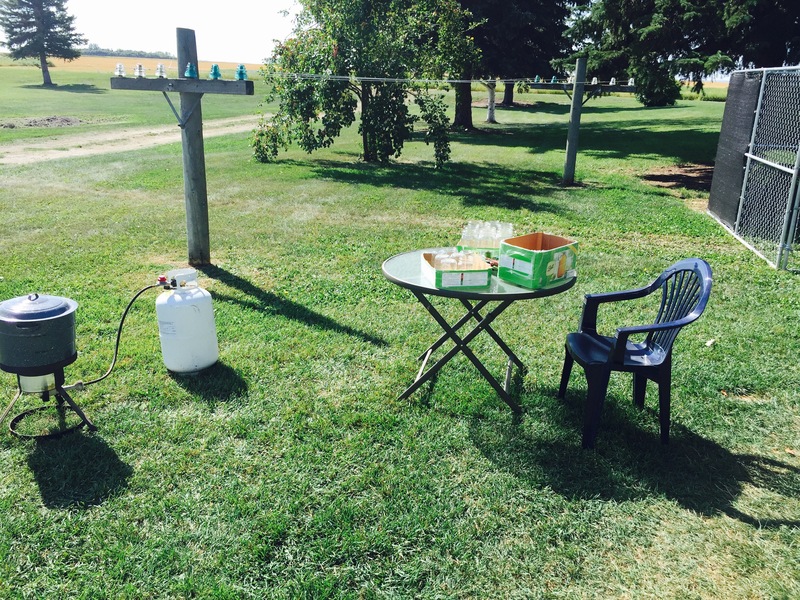 The turkey fryer was my sterilization area as well as the hot water bath area. Having no dishwasher or oven I chose to use boiling water to effectively sterilize my jars. 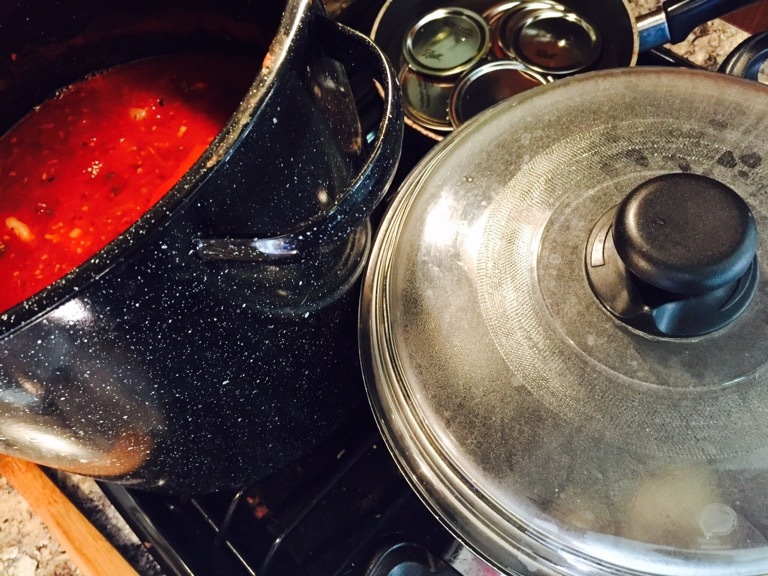 The canner pot served two alternating purposes; the same water sterilized and hot water bathed my okra, sauce and relish. Inside the camper I set up the stove for lids, sauce and an open burner to alternate duties such as brine creation for the okra, boiling water to peel tomatoes or simply cooking relish. I had three counter areas set up, one for packing jars, another for chopping or shredding and the third to alternate cleaning and resting as required in my recipes. Indeed it was hectic but with my careful planning I was able to work on all preparations simultaneously. Jars were sterilized then packed and hot water bathed. 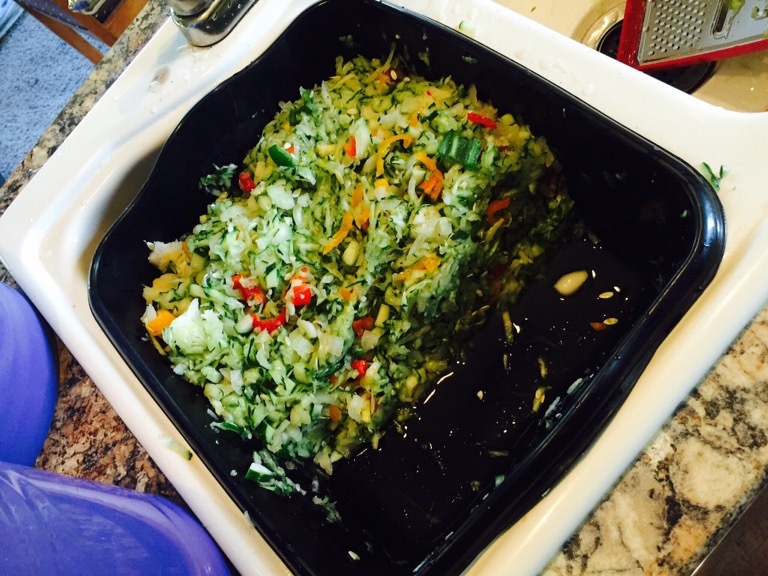 Meanwhile I worked on shredding relish components that had to set with salt for 3 hours. Processed jars came out, empty ones went in for sterilization and I worked on peeling tomatoes. I think you get the drift. It went like clockwork. 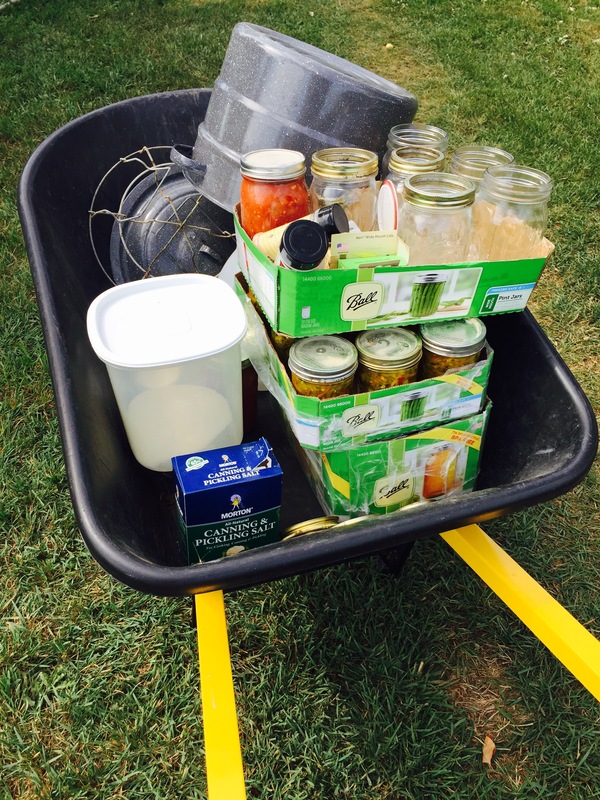 Preserving shelf stable goods can be quite a task. With space limitations there are other ways to extend the life of your produce without having to freeze or heat can. Rule number four; do not underestimate the power of your refrigerator. Yes! You can have crunchy delightful pickles without a heat source of any kind. I’m not talking about naturally fermented pickles but simple recipes using a basic mix of sugar, salt, spices and vinegar. As always, it’s best practice to sterilize your jars if you plan on keeping things for longer than a couple weeks. 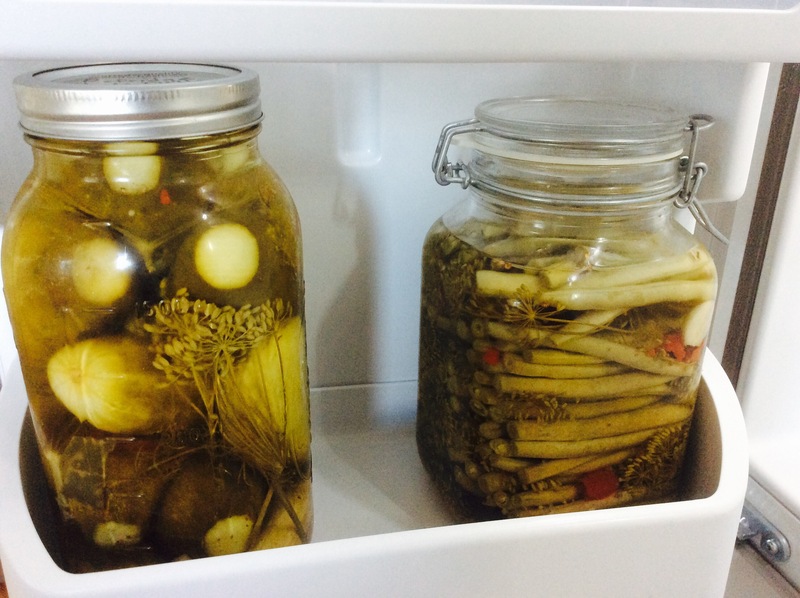 Last year I blogged a couple recipes my family enjoys – Fridge Pickles. This year I spread my wings a bit and used this format applied to whole dills, dilly beans, banana pepper rings and pickled okra. It’s easy, it works and it’s great for use in small spaces! And finally, rule five; food safety is a requirement not an option! I can’t stress it enough, safety first! You might think it’s enough to just wash your jars with soapy water but is not enough. Nor is it enough to simply run your jars through the dishwasher; close but no cigar. In fact, I wrote an entire blog dedicated to this rule – The Horrors. The best way to avoid getting sick with things like botulism is to process your food the right way. High acid foods do well in a hot water bath but less acidic foods require pressure and heat. Do your homework. In a small space it might be tempting to skip steps because you just don’t have the means. If you find yourself in this predicament, perhaps you could turn to borrowing a friend’s kitchen. In exchange for a few jars of your famous salsa, I’m sure most would be happy to oblige. So, I’ve proven to myself it is possible to can food while living out of my camper. It’s more work logistically speaking but the benefits I reap are exacly the same. Pesticide-free, organic food, all stocked on my shelves for the upcoming year. The dirt on my plate is tasty as well as rewarding! PS – Stay tuned for my Picked Okra recipe. I tweaked Paula Deen’s recipe and it’s super YUMMY! Whoa! It certainly was bountiful. Well done!